If you have never been north of the Arctic Circle, it is easy to imagine that the “ice cap” at the top of the world is a uniform sheet of white. The reality, particularly during the spring and summer melt, is a mottled landscape of white, teal, slate gray, green, and navy. 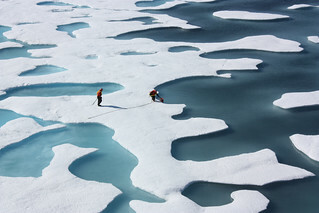 The sea ice atop the Arctic Ocean can—as shown in this photograph from July 12, 2011—look more like swiss cheese or a bright coastal wetland. As ice melts, the liquid water collects in depressions on the surface and deepens them, forming melt ponds. These fresh water ponds are separated from the salty sea below and around it, until breaks in the ice merge the two. Researchers on the NASA-funded ICESCAPE mission—Impacts of Climate on Ecosystems and Chemistry of the Arctic Pacific Environment—have been examining melt ponds, the ice around them, and the waters below for three weeks, with three more to go. Carried by the U.S. Coast Guard Cutter Healy, a team of oceanographers, marine biologists, and glaciologists are investigating how changing conditions in the Arctic affect the ocean’s chemical and biological makeup. The science team collects water samples to examine water chemistry and to observe the colonies of plankton growing in the water and on the surfaces of the ice. Other instruments are used to assess how much and how far sunlight is penetrating into—and warming—the Arctic Ocean. Still others are measuring the current systems that move water from the depths to the surface, as well as horizontally across the Beaufort and Chukchi Seas. Incidentally, the crew members in the photo are not harvesting data; they are collecting supplies. A C-130 airplane flew by earlier in the day, dropping a parachuted canister of hardware for fixing instruments and other machinery on the icebreaker. NASA science writer Kathryn Hansen is blogging daily from the ICESCAPE cruise. Click here to learn some science, see what people are eating, and sample life on an Arctic icebreaker. You can also get a daily glimpse of the ice in the Arctic by clicking on the MODIS Rapid Response page. NASA photograph by Kathryn Hansen. Caption by Mike Carlowicz.